Clovelly is ideally situated for the beach, shops, coffee shops & Llawnroc hotel It is a very comfortable 3 bedroom bungalow with disabled access to the front and rear of the property, suitable for wheelchairs and buggies. It has oil fired central heating and is lovely and warm for those winter days and evenings. With an enclosed garden it is brilliant for children, ball games and sunbathing! Clovelly has a choice of rooms to suit your needs, you can eat breakfast in the sun lounge, morning coffee in the conservatory, lunch in the garden! Clovelly is provided with a range of outdoor furniture for those wishing to sunbathe. There are a choice of indoor sitting areas, for you to use, sitting room, conservatory & dining room ideal for those families or friends wanting to do a variety of activities. Watch freeview television, play games, read a book or do a jigsaw on the sun lounge table. We also have a full mobile phone signal in Gorran Haven now! We also start your holiday with a home-made Cornish cream tea! We have lived in Gorran Haven for 28 years. We have a Son and Daughter in law and a Daughter and Son in law plus 3 grandchildren. Family is important to us and that is why we want to make your family holiday as special as we can. We have looked after other peoples holiday lets and now enjoy letting our own holiday bungalow. We have made Clovelly as comfortable as we would like it, and want you to enjoy your holiday in Gorran Haven as much as we like living in Gorran Haven. Jayne enjoys baking and bakes fresh scones for your arrival, so that you can enjoy your cream tea. We love Clovelly, it has a beautiful private garden, which is in full sun all day. The garden has flowering cherry trees which look beautiful in the spring when the blossom is out. The rooms are bright and nicely decorated, with lots of space to find a chair that suits you. We have Wi-FI. We also have Freesat TV Clovelly is far enough away from the beach to be peaceful but also near enough to walk to the beach in a few minutes. Living in Gorran Haven means that we can look after Clovelly and if you do have any problems we are near enough to sort them out. We enjoy preparing Clovelly for each guest. We do want you to enjoy your holiday. Clovelly has its own enclosed garden, own parking. Peace and quiet. The post box is just outside on the green, handy for posting all those postcards! It is in walking distance of the local hotel, ideal for a meal out and handy walking distance to the local shop, teashops and beach. Clovelly offers peace and quiet, a lovely garden to enjoy outdoor eating. No stairs to climb, everything on one floor, with lots of rooms to choose to relax in. We provide all bedding, towels and beach towels, allowing you more space in the car to bring the things you want to bring! We also leave a cream tea for your arrival! En-suite shower room with WC & wash basin to bedroom 2. Main bathroom with bath/shower over, WC & wash basin. WC with wash basin. Hand towels & bathmats provided in each bathroom. Oil fired central heating provided Lots of hot water! Washing basket, pegs all in the laundry area. The Wi-Fi code is sent to you along with other info just before your holiday. Lounge has Freeview TV, DVD player, CD player with a selection of CD and DVDs, with doors opening into the sun-lounge. Dining room has table and chairs for seating 6/7, bookcase with a selection of books, games and jigsaw puzzles. Dishwasher tablets and rinse aid are provided. salt, pepper, cooking oil available. Plus milk, tea, sugar, Jam for the cream tea. Clovelly has lots of crockery, cutlery, pans, serving dishes. The dining room has chairs for six with chairs in the sun lounge that can be used in the dining room as well. Selection of games and jigsaw puzzles in the dining room cupboard. Why not try Cornish Monopoly? Selection of Cd's in the dining room. Private garden, ideal for young children to run round. Tennis court up Bell Hill ideal for a quick game of tennis, near a small play area for children. Clovelly has two main doors front and rear both with gentle slopes for wheelchair access or walking frames. There is a path round the garden so that wheelchairs or strollers can be used out side. Notes on accommodation: Cream teas are provided for your arrival, all you have to do is unpack and then unwind whilst you enjoy your cream tea or you can choose a chocolate cake if you prefer, homemade mince pies & clotted cream if you are staying for Christmas. Christmas decorations are available. No smoking thank you! Outside: Lovely secluded garden, with fence and gates, Clovelly has some lovely trees which can offer shade if you prefer sitting out of the sun. It also offers lots of space for sitting in the sun. It is safe for children to play in, we do have a no pets policy. We have a barbecue with garden furniture, plus two loungers for sun bathing. The garden is private and no one can look in. Utility Room: Washing machine, ironing board, iron, laundry basket with pegs, clothes airer. Door leading out to the patio area with rotary washing line. Cleaning / Towels / Linen / Maid service: Towels and bedlinen are provided. Beach towels provided. Clovelly is cleaned for your arrival and can be cleaned during your stay for an extra fee. Other: Conservatory with two large comfortable cane chairs and stool, ideal room when reading. Sun - lounge with luxury sofa bed, 2 chairs and a small dining table with four chairs, also with sliding doors onto the patio. This bungalow is wonderfully located for beach and coast path. It has everything you could need inside, plenty of crockery, cutlery etc. The dishwasher and washing machine were really appreciated. Plus this accommodation has so much space, we all enjoyed the wonderful conservatory especially, great views and so sunny. The garden can be completely enclosed if you shut the gates, great for children and dogs, and the garden is large. Extras like books, games, two TVs, and the amazing scone tea left for our welcome make this a place to return to. Probably the best holiday cottage I've ever rented. Many thank's for your lovely comments, it was a pleasure to have you all stay at Clovelly. We are pleased you had a great time, it always helps when we get great feedback, especially at the end of the season! We are looking forward to having you stay again sometime. Yet again another fabulous holiday! A very clean, tidy and well equipped bungalow. There is lots of space to loose yourself for some peace and a lovely peaceful garden to relax in without any disturbance and a chance to enjoy some sunshine! The owners are very kind and nothing is of any trouble! Amazing coffee and walnut cake on arrival. I am pleased you enjoyed your stay, and the coffee & walnut cake. Thank you for leaving Clovelly so clean and tidy, look forward to having you stay again. 'Clovelly' is a super place, in ideal setting with easy access to the beach. Beautifully clean, spacious and comfortable. Many thanks to Jayne and Richard for their excellent service and very kind gestures. We stayed here a few years ago. We do a lot of self catering holidays and what immidiately strikes you is how very clean and well presented Clovelly is. They obviously keep it in tip-top condition. Everything works and has all we needed. It's very comfortable and in a lovely location, with views over the valley. Many thanks for coming to stay at Clovelly again. Beautiful, well maintained and clean bungalow. Warm and friendly welcome, delicious cake on arrival! Such a clean and tidy bungalow with everything you could possibly need. Lovely location in a peaceful village and a lovely secluded garden to relax in! This is the 3rd year we have rented this bungalow and already booked up for next year. Thank you for your review. It is always rewarding when people book to come back year after year. This was our 5th stay at Clovelly and as usual everything was perfect.Jayne and Richard lay on a cream tea on arrival much appreciated after a long drive. The bungalow is beautifully maintained and immaculately clean. The garden is large and safe for children to play in. Clovelly is situated halfway up a hill that leads to the beach about 6 minutes walk away it's not too demanding a walk. The beach is safe for kids and not too large with a bakers,chip shop as well as a couple of cafes. We rate Clovelly so highly we've booked for next year already. Many thanks for your review. It is always a pleasure having you stay. Pleased you love Clovelly. 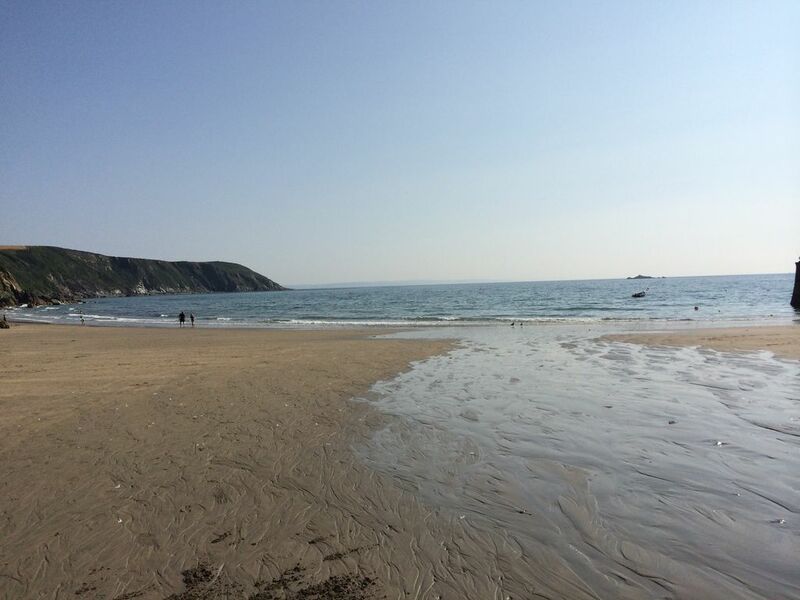 Gorran Haven has a sandy beach 7 minutes walk away. Great Perhaver Beach (0.4 miles). Airports at Newquay and Exeter. Car hire would be recommended, though there is a local bus traveling from St Austell daily. About 2 miles from Mevagissey. About 4 miles from The Lost Gardens of Heligan. About 9 miles from St Austell. About 12 miles from the Eden Project. About 15 miles from Truro. Asda and Tesco are both in St Austell. Sainsburys, Tesco and Asda all do Home delivery to Gorran Haven. Most banks are in St Austell and Truro. Gorran Haven, Gorran and Mevagissey all have a post office. The local surgery is in Mevagissey. Swimming pool in St Austell and the Seahorse Centre at Pentewan Sands has two heated swimming pools with water flume and Jacuzzi. Just to say thanks again for the use of Clovelly. It is a beautiful bungalow in a fantastic setting. We had a great time there. I just want to say thank you very much for the rental of a fabulous property - it certainly was a big part of the enjoyment we had last week in Cornwall. You should be very proud of the property. Booking Notes: Booking is made through the proprietor. A non - refundable deposit of 33% is required on booking and the balance is due six weeks before the start of your holiday. Please note it is a Saturday Changeover. Changeover Day: Saturday changeover day. Leave at 10.00am. Arrive at 4pm.